This mid-afternoon, 360-degree panorama was acquired by the Mast Camera (Mastcam) on NASA's Curiosity Mars rover on April 4, 2016, as part of long-term campaign to document the context and details of the geology and landforms along Curiosity's traverse since landing in August 2012. The view combines dozens of images taken during the mission's 1,302nd sol, or Martian day, by Mastcam's left-eye camera from a location on top of what rover team members call "Naukluft Plateau" on lower Mount Sharp, which stands inside Gale Crater. The foreground and middle distance show a geologic scene dominated by eroded remnants of a finely layered ancient sandstone deposit. 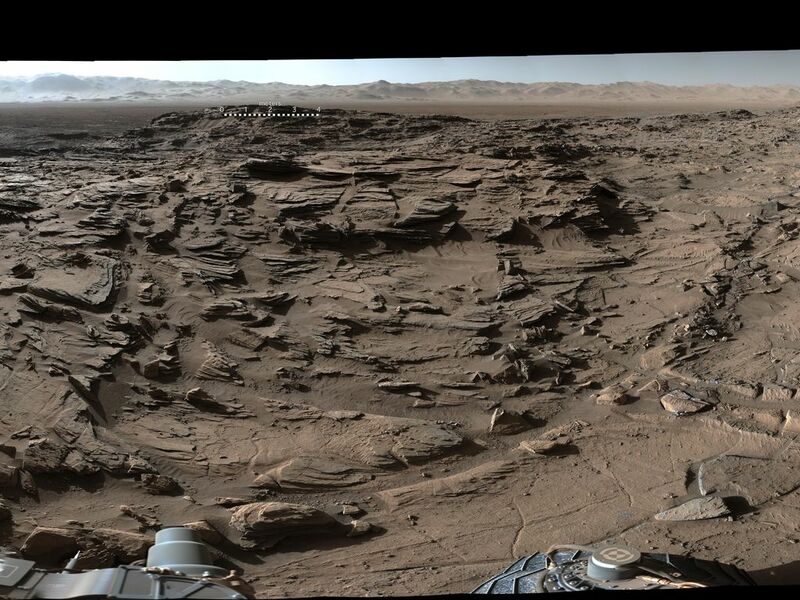 Since landing, the rover traversed through terrains dominated by water-lain sedimentary rocks (mudstones and siltstones, and early on, conglomerates), some of which have contained minerals like clays that attest to the ancient presence of water. However, the rover crossed into very different geology while climbing onto the Naukluft Plateau. The sandstone here appears to be dominated by thick layers of windblown sand, suggesting that these deposits formed in a drier epoch. 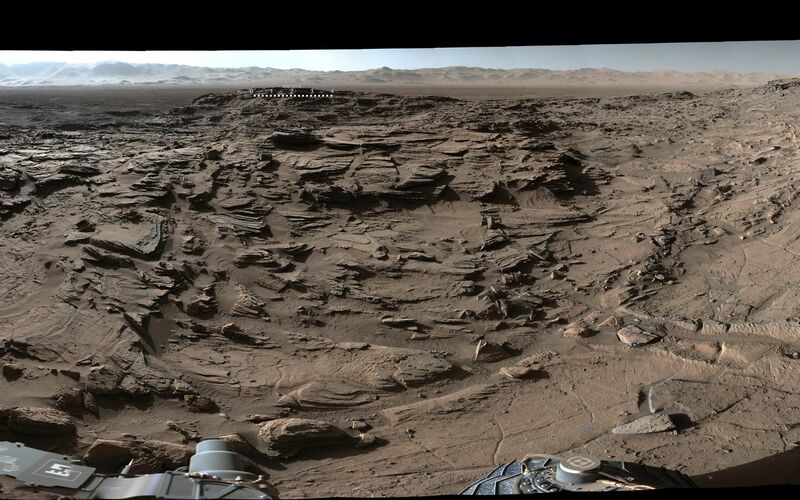 These rocks resemble the types of rocks that a dune field like the "Bagnold Dunes" (PIA20283) -- visited by Curiosity in late 2015 and early 2016 --would form if buried. A portion of the rim of Gale Crater fills the horizon in the center of the image, with upper Mount Sharp on the horizon at right. South is at both ends of this full-circle scene; north is at center. 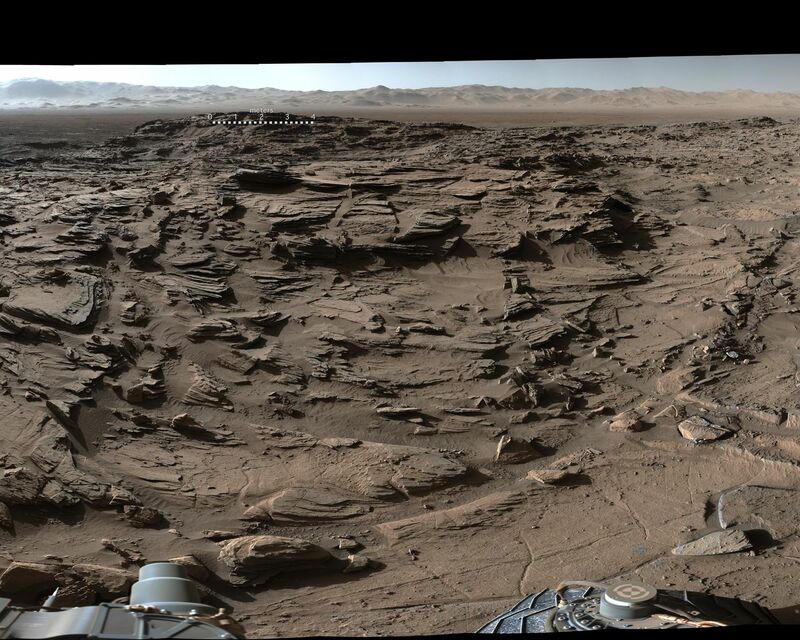 The rover's location when its Mastcam acquired the component images of this scene was the site it reached in its Sol 1301 drive, [http://mars.nasa.gov/msl/multimedia/images/?ImageID=7787]. Figure 1 adds two small scale bars to the scene. One at left center is placed on rocks about 16 feet (5 meters) from the camera and marks a length of 50 centimeters (20 inches). The other is in the upper center of the scene, placed on rocks about 164 feet (50 meters) from the camera and marking a length of 4 meters (13 feet). NASA's Jet Propulsion Laboratory, a division of the California Institute of Technology, Pasadena, manages the Mars Science Laboratory Project for NASA's Science Mission Directorate, Washington. JPL designed and built the project's Curiosity rover and its Navcam. For more information about Curiosity, visit http://www.nasa.gov/msl and http://mars.jpl.nasa.gov/msl. Photojournal Note: The main image is also available in full resolution TIFF file PIA20332_full.tif. This file may be too large to view from a browser; it can be downloaded onto your desktop by right-clicking on the previous link and viewed with image viewing software.